Disclosure: Gallo Family Vineyards provided LatinoFoodie a bottle of Moscato wine in order to facilitate this post. However, all opinions are our own. Warm summer months call for cool summer wines, and nothing beats a glass of chilled Moscato wine. Moscato is a light-bodied and refreshingly sweet wine varietal that nobody will look twice at if you drop an ice cube in your glass. It’s sophisticated, yet playful. So playful that we decided to create a dessert recipe with the wine – Pink Moscato Strawberry Panna Cotta. A glass of Pink Moscato is a little different than a traditional Moscato by taking its flavor profile beyond peaches and honey, to embrace fresh berries and orange blossoms. Although May 9th was National Moscato Day, you can enjoy the season year-round because Gallo Family Vineyards has pressed summer in a bottle for your enjoyment and we are excited to be working with them to bring their Pink Moscato for your summertime celebrations. While you are planning your 4th of July festivities, consider Pink Moscato for your guests to drink while the carne asada is being grilled and as an accompaniment to a spicy guacamole with tortilla chips. 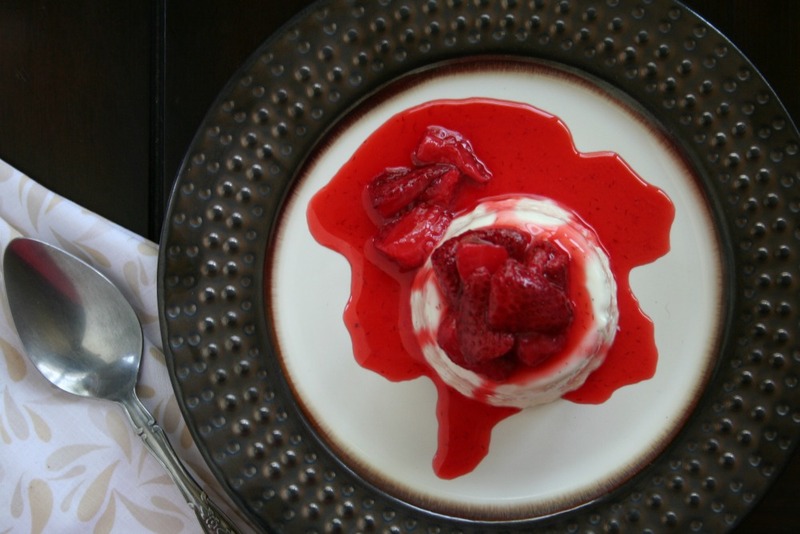 To flavor-bomb your 4th of July companions, flaunt your skills with a delicious Pink Moscato Strawberry Panna Cotta for dessert. Now, before you raise a white flag to making panna cotta, let me tell you it is as easy as making ice cubes. Panna cotta is basically a cream based gelatin dessert and can have the consistency of soft and firm tofu. The cream, or milk, is heated gently and then mixed with gelatin. Once you refrigerate the dessert, the hard part begins: waiting. The gelatin dessert was traditionally topped with ripe berries, fruit sauces or honey. Once sugar became more widely available, cooks sweetened the gelatin itself, ushering in the new age of gelatin. Today, panna cotta is often kept simple and flavored with scrapings of vanilla beans or vanilla extract. My panna cotta recipe is infused with the fresh berries and orange blossom experience of Gallo Family Vineyards Pink Moscato. By allowing the gelatin powder to bloom in the wine, and then mixing with it the heated cream, you are infusing summer in your dessert. Punch up the flavor further by macerating some fresh strawberries in Pink Moscato to top off your dessert. The recipe that follows is easy and will yield an impressive treat for you and your guests. A quick tip on unmolding: simply place the bottom of your gelatin mold in hot water for a few seconds. Run a knife around the edge and let it slide out of the mold onto a plate. The good news is that you do not have to unmold your dessert. Simply top it off with the Pink Moscato Strawberries for an elegant and effortless end to any meal. In case you are wondering, yes, Moscato wines are fit for dessert, but they are also perfectly paired with spicy food, especially Latin dishes. And if one Moscato is not enough, Gallo Family Vineyards actually has three: traditional White Moscat0, Pink Moscato and a lively Red Moscato. We will be celebrating summer with Gallo Family Vineyards and their lovely wines; Moscato pulled pork anyone? Gallo Family Vineyards is the proud producer of flavorful wines that celebrate the spirit of hardworking American families of all shapes, sizes, and forms. The vast portfolio includes 16 fruit-forward wines. Visit Gallo Family Vineyards online to learn more about their wines, or find them on Facebook, Instagram and Twitter. We hope your 4th of July celebrations are filled with friends, family, fireworks and fun, and as always, please drink responsibly. Combine the cream and sugar in a medium size sauce pot. Heat until the sugar has dissolved. Remove from the heat. Using a small paring knife, cut the vanilla bean lengthwise and scrape out the beans. Mix in the beans and the remaining pod into the heated cream. Cover and allow to steep for 25 minutes at room temperature. Oil your panna cotta molds: you can use ramekins, small cups, or bowls. Simply coat the inside with canola cooking oil if you want to unmold your desserts with ease. Meanwhile, pour ½ cup pink moscato in to a large mixing bowl and sprinkle the powdered gelatin on top. Allow to sit for about 10 minutes, in which time the gelatin should bloom. Reheat your cream until it is just warm. Pour your cream over the gelatin and stir until the gelatin has dissolved, discard the vanilla bean pod. Divide the gelatin evenly between your prepared molds. Chill until set. While your panna cotta sets, place the strawberries, lemon juice and 3 tablespoons pink moscato in a small sauce pot. Over medium heat, bring the mixture to a boil and then reduce the heat a low simmer. Cook the mixture until it thickens to a sauce consistency. Allow to cool before using on your panna cotta or else it might melt your dessert.